Reviewed by Omar Jbilou. Viewed at the AFI Fest 2018. Arrested in 2010, Jafar Panahi was charged with propaganda against the Iranian government and sentenced to 6 years of jail and 20 years of house arrest. He is known for his no-budget humanistic movies that get smuggled out of Iran to be shown internationally. For the fourth time since his ban, the award-winning director surprises us with another provoking movie proclaiming the ugly truth of his oppressive country that won Best Screenplay award at the 71st Cannes Film Festival and Best Film at Antalya Golden Orange Film Festival. “3 Faces” features Panahi, Behnaz Jafari and Marziyeh Rezaei traveling to Northwest of Iran to investigate the suicide of Marziyeh Rezaei, all three playing themselves. The movie opens up with a selfie video of Marziyeh committing suicide as she explains that her family forbade her from studying acting. She reaches out to the famous actress Behnaz Jafari in a last attempt to be saved from her misery. Panahi and Jafari decide to drive to her remote village next to the border of Azerbaijan and Turkey to find out the truth about what happened to the girl. Jafari is watching the video over and over, tortured by the idea that her neglect might have caused the girl’s suicide. She’s suspecting the video to have been faked or edited by a director and starts even questioning Panahi who brought the video to her. 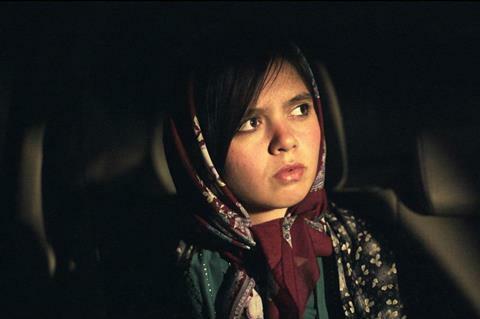 Using a fixed camera in Panahi’s SUV, the car ride is mostly medium shots of one or the other. Jafari starts thinking that the villagers might be covering up her suicide since it is a shame in their culture, but Panahi points out that a wedding would not be taking place in that case out of respect for the grieving family. Throughout the journey, they get to see the light-minded old schooled mentality of the villagers that the young girl would be stuck with if not allowed to finish her acting career and become an “entertainer”. One example is the man who pretends he owns the “Bull with the golden balls” and that every cow in the village calls for him as he can impregnate dozens per day. When they arrive at the village, they end up finding Marziyeh’s house and have a chat with her mother after we witness a brother hysterically order them to leave. The duo finally gets a hint when they find Marziyeh’s cousin and she takes them to where she’s hiding. Jafari filled with rage refuses to hear Marziyeh until the girl starts sobbing and begging her to listen. “3 Faces” is a movie about three women, Jafari a famous actress, Marziyeh the young countryside girl who dreams of becoming one and finally Sherazade the unseen old entertainer that ended up isolating herself in the village. Although it was one risky move to leave one of the three major characters out of the picture, it is clear that she ultimately portrays the strain and injustice that actresses face in patriarchal Iran. Jafar Panahi who has refused the opportunity to leave his country illegally several times is still making movies with the slight resources he has. He hopelessly addresses the different issues in his country through filmmaking to promote growth and progress among Iranians. Even though he only plays a secondary role in the movie, Panahi’s acting is sharp and evokes some kind of wisdom. The fact that every actor is playing themselves also makes us forget that they are even acting which is the ultimate goal of a movie. Despite some shaky shots and the cheap feeling it gives, I enjoyed every minute of this movie. I will give it an 8/10.